Florida and the NCAA are investigating an allegation that former Gators offensive lineman Maurkice Pouncey received $100,000 from a representative of a sports agent before last season ended, ESPN.com reported. The allegation stated Pouncey received the money between Florida's loss to Alabama in the Southeastern Conference title game and its Sugar Bowl win over Cincinnati, according to the report. The alleged representative was not named. "We were made aware of some information in early June that we reported to law enforcement and we then shared with the NCAA and the SEC," Florida athletic director Jeremy Foley said in a statement. "At this time, we have no information that has indicated that there are any compliance issues for the University of Florida." 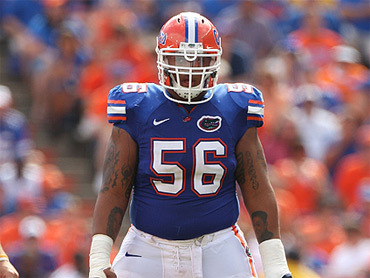 Pouncey was selected 18th overall in this year's NFL draft. His brother, Mike, will be a senior offensive lineman with the Gators next season. Pouncey's agent is Joel Segal, but the allegation is not necessarily tied to him. A message left at Segal's office Monday seeking comment was not immediately returned.